Iran, Feb. 6, 2019 – Members of Resistance Units, a vast network associated directly to the Iranian opposition People’s Mojahedin Organization of Iran (PMOI/MEK), are carrying out measures marking February 8, 1982, when many units of the Iranian regime’s Revolutionary Guards (IRGC) attacked and killed over a number of PMOI/MEK teams in Tehran. Members of Resistance Unit 770 in Tehran set fire to a poster of Iranian regime founder Khomeini located on Rajaie Highway. In Miandoab, northwest Iran, members of a resistance unit set fire to a poster near a base of the IRGC Basij paramilitary forces while chanting, “Death to Khamenei, Hail to Rajavi,” referring to Iranian Resistance leader Massoud Rajavi and opposition President Maryam Rajavi, head of the National Council of Resistance of Iran (NCRI). Members of resistance units in Hamedan, western Iran, gathered at the gravesite of a number of PMOI/MEK martyrs to pay their respects and lay flowers in their memory on this occasion. The arrest of representatives of Ahvaz Steel workers and protesters, which started last midnight (Sunday, December 16), continued on Monday, December 17. The number of detainees has reached dozens, the names of 31 of whom have been published so far. At the same time, the mullahs’ regime had stationed repressive forces from the Ministry of Intelligence, riot police and forces affiliated with the IRGC and IRGC intelligence in various sensitive locations in Ahvaz so that workers could not continue their protests. However, the workers, despite the fact that they were surrounded by oppressive forces in some places, continued to demonstrate with slogans such as: “Imprisoned workers must be freed”. Workers, being threatened by repressive forces, said they would continue their demonstrations until the release of the arrested and achieving their demands. Workers and laborers from different parts of Iran, including the Tehran Bus Company workers’ syndicate and truck drivers in various parts of Iran, expressed their solidarity with Ahvaz workers and called for the immediate release of the detainees. Saluting the brave and adamant workers of Ahvaz, the Iranian Resistance described the brutal and mass arrests on Sunday night and on Monday as indication of the frustration of religious fascism in the face of the strikes and protests of workers, and called on all workers and youth and students, especially in Ahvaz and Khuzestan, to support the striking workers of Ahvaz. It also called on international human rights and workers’ rights advocates and workers’ unions and syndicates in different countries to support the striking workers who are protesting for their basic rights, and to take necessary measures for the release of the arrestees. Iran, Nov. 19, 2018 – On Monday, the workers of Haft Tapeh sugar mill in Shush, southwest Iran, started their demonstration at the factory and marched toward the city proper. Today’s demonstration is in support for the representatives of protesters, who were arrested by the Iranian regime’s security forces yesterday. In the city, the workers gathered in front of the mayor’s office and protested to the arrest of their colleagues. The workers of the Haft Tapeh Sugar Mill have been protesting for 15 days to unpaid wages and the transfer of the company from the private to the public sector. The protesters have been very vocal in their criticism of the corrupt policies of the Iranian regime and have received wide support from different communities across Iran. On Sunday, at the end of the day’s protests, the security forces of the Iranian regime arrested the representatives of the protesting workers along with a number of the workers, and transferred them to the security police headquarters. 10:50 am local time: Workers gather in Ghanoun Blvd. in front of the prosecutor’s office. The people of Shush gather to support the workers of Haft Tapeh and join their voices to those of the unprivileged workers. 10:30 am local time: The people of Shush gather to support the workers of Haft Tapeh and join their voices to those of the unprivileged workers. 9:30 am local time: The bazaar of Shush was shut down and different communities join the protesters of Haft Tapeh. A group of drivers from the Haft Tapeh Mohajer Agency expressed their support for the demands of the protesters of Haft Tapeh and the imprisoned protesters. The enraged people are marching toward the courthouse of the Iranian regime to protest against the arrest and of their colleagues. 9:00 am local time: The enraged people of Shush and the workers of the Haft Tapeh Sugar Mill are marching toward the courthouse of the Iranian regime to protest against the arrest and imprisonment of their colleagues. Below are some of the videos of people of Shush supporting the protesters of Haft Tapeh. 9:00 am local time: The people of Shush have joined the workers of Haft Tapeh in their protest in front of the mayor’s office. 8:00 am local time: Pictures of the 15th day of protests by the workers of Haft Tapeh Sugar Mill. The workers of the Haft Tapeh sugar mill have been protesting for more than two weeks to their four months’ worth of unpaid wages as well as the transfer of the company from the private to the public sector. Mrs. Maryam Rajavi president-elect of the National Council of Resistance of Iran, hailed the workers of Haft Tapeh and described their protest as the will of the Iranian people to overthrow the Iranian regime. Iran, Nov. 15, 2018 – Recent reports indicate the Iranian opposition People’s Mojahedin Organization of Iran (PMOI / MEK) network inside Iran is escalating its anti-regime activities across the country. Members of PMOI / MEK Resistance Unit 267 in the city of Dorud in Lorestan Province, west of Iran, braved the odds and set fire to a billboard of Iranian regime Supreme Leader Ali Khamenei. The resistance units’ non-stop activities throughout Iran has reached a point that Ali Akbar Raefipoor, a figure said to be close to Khamenei, made the following remarks on this subject. These remarks were aired on June 17, 2018. Of course, Raefipoor is not the only Iranian regime figure making such remarks about the PMOI / MEK resistance units. Former intelligence minister Hedar Moslehi said it in even more precise terms. “In 2018 or 2019, the enemy will definitely be planning a sedition and the main target will be the Supreme Leader,” he said according to the state-run Entekhab website. This is a clear indication of major defections in the Iranian regime’s ranks and files, and many losing hope in fear of the regime’s upcoming overthrow. As we are on the brink of a new revolution in Iran and the toppling of the mullahs’ regime is now more definite and imminent than ever before, it is important to know how we have reached where we are and that events up to this point have not been mere coincidences. The mullahs’ regime has a major crisis in the just and democratic opposition movement. An entity that has been paying the price of its struggle for nearly four decades, standing firm on their objectives and principles, defying all odds before execution squads and the gallows, in the face of torturers and hundreds of prisons checkered across Iran. We can now be certain in saying the People’s Mojahedin Organization of Iran (PMOI / MEK) and the organized Iranian Resistance movement are realizing the overthrow of this regime. While many now claim to oppose this regime, the PMOI / MEK understand the importance of the status more than any other party, planning and directing today’s circumstances towards a true revolution. Iranian Resistance leader Massoud Rajavi based his strategy on “resistance units” inside Iran, with the objective of establishing units inside the society and forming a bond between the files of this revolution with the ranks seen in the central core of this movement, being the PMOI / MEK. Although this strategy was blueprinted years ago, as crises inside Iran escalate and the regime is witnessing more rifts inside its apparatus, along with the ongoing uprising continuing to this day since the Dec/Jan revolt, the “resistance units” strategy has implemented its impact across the board. They have now become the target of a demonizing campaign by elements of this regime inside Iran and abroad. From the Iranian regime’s state-controlled media and remarks heard from numerous regime officials, we can easily conclude that the resistance units have transformed into a major concern for the mullahs’ apparatus. The mullahs’ own media outlets even go the distance by emphasizing the role of other so-called opposition movements to thus decrease the importance and credibility of the Iranian opposition coalition National Council of Resistance of Iran (NCRI) and the PMOI/MEK as the core member of this opposition movement. However, considering the powder keg circumstances of Iran’s society, the PMOI / MEK, having an organized structure, has been able to impact the on-the-ground events. One must admit that the resistance units are the most important force of the Iranian people’s revolution, and they are playing their historical role in various methods. In all revolutions we have witnessed how the ruling regime’s resort to utter crackdown and threats. Although all such examples have led to the regime’s overthrow through a massive and revolutionary movement, all regime’s consider themselves to be an exemption. In such a period, if popular protests are organized and directed by an organized resistance force, the regime’s escalation of crackdown measures will not only fail to delay the upcoming revolution, they will actually further radicalize the society and lead to an even faster toppling of its entire apparatus. As a result, resistance units play a very important role in this day and age in breaking the heavy atmosphere of crackdown. This is realized through directing and organizing the revolution at critical junctures. With conditions inside Iran and abroad changing dramatically, the PMOI / MEK implemented its new strategy of launching resistance units. Numerous teams, forming a huge network, are now in direct contact with the Iranian society. By organizing and leading the Iranian uprising in an effective manner, resistance units are injecting new life in the society and protesters on the streets. Iran: Protest rallies reported in Tehran and two other cities. Iran, Sept. 18, 2018 – With each passing day protest rallies are mushrooming on a more frequent basis across Iran. Clients of the Caspian credit firm, associated to the Iranian regime’s Revolutionary Guards (IRGC), rallied outside the Central Bank on Monday and closed the Mirdamad Avenue. They were heard protesting and complaining about their savings being stolen. In Rasht, northern Iran, another such rally was held again by Caspian clients also demanding their savings returned. Also in Rasht, retired workers of the Iran Poplin factories held a rally demanding their due paychecks and protesting delays in this regard. They were also complaining how stock owners have yet to receive their profits. In Kuhdasht of Lorestan Province in western Iran a number of locals were seen rallying outside the city’s mayor office and Road & Construction Department protesting water shortages and very poor road conditions. In an interview with One America Network, Ali Safavi, a member of the Iranian opposition coalition, the National Council of Resistance of Iran (NCRI), sheds light on the opposition movement’s role inside the country ongoing protests throughout Iran and the foreign policy the Trump administration can take in regards to Tehran’s mullahs. “Obviously, the protests that you see now are the continuation of the major nationwide uprisings that erupted back in December and January in 142 cities. The main reason is the fact that the Iranian regime has been unable to address the many demands of the Iranian people. The economy is on the verge of bankruptcy,” Safavi explained. The Iranian people are now seeking regime change and the mullahs are fearful of this very savvy nation. Over 44 million people in Iran are active on the popular messaging app, Telegram, and becoming more informed about news from throughout the country and across the globe. This is breaking the barriers imposed by the mullahs’ regime and allowing dissidents to coordinate their anti-regime protests. Iranian protesters are also very angry over the mullahs’ foreign policy of providing over $100 billion propping the Assad regime in Syria, hundreds of millions of dollars each year to fund the terrorist Lebanese Hezbollah group, financial and military assistance to sectarian Shiite militias in Iraq, Safavi explained, adding the importance of Washington vocally supporting the ongoing protests in Iran. “To the extent that the [Trump] administration pursues a firm and decisive policy against the mullahs of Iran, I think that sends an encouraging signal to the people of Iran. If the Iranian people see on the international level there is support for their aspiration and that there is an attempt to deny the Iranian regime the means with which it suppresses its own people and foments chaos through the Middle East, they would be encouraged and they would be emboldened,” Safavi added. The PMOI/MEK network inside Iran has been actively establishing “Resistance Units” and heavily focused on organizing these protests. Young men and women are leading the demonstrations against the regime, and literally connect the variety of opposition pockets together in the struggle against the mullahs. In the past three days, Iranian cities have witnessed a widespread wave of mass protests and demonstrations against a corrupt religious dictatorship. In the following reports, you can see the latest news and videos in this regard. Published on 02 August 2018 . On Thursday, August 2, on the second day of the uprising, protests spread to various cities of Iran. Demonstration of angry people that had begun on Thursday morning in Isfahan, Shiraz, Mashhad, Shahin Shahr, Najaf Abad, spread to Ahvaz, Arak, Karaj, Tehran and many other cities hours later. Since this morning, Thursday, August 2, angry protesters in various cities across the country, including Isfahan, Mashhad, Shiraz, Najaf Abad and Shahin Shahr, demonstrated against the tyranny of the mullahs’ regime, chanting slogans such as: Death to the Dictator. It was at a time when the repressive forces were on full alert from the first hours of the morning to prevent the formation of these protests, but they failed. The Internet connections have slowed down in many parts of the country. Courageous people and youths, especially young girls, demonstrated on Wednesday evening, August 1, for the second straight day. Police and suppressive intelligence forces, riot guards, IRGC, Bassij and criminal plainclothes mercenaries were deployed to prevent uprising of the fed-up people. However, the fearless youths rallied from the first square of Gohardasht toward Motahari Street. The crowd, which was growing every moment, chanted: “Cannon, tank, firecracker, the mullahs must get lost”; “Death to the Dictator”; “Our enemy is right here; they are lying that it is America!”; “Let go of Syria, think about us”; “Khamenei lives like gods, while the people live in poverty”. Iran, August 2, 2018 – Protests that started on Tuesday in different cities of Iran over high prices and economic woes entered their third day on Thursday. In Shapour, Isfahan, where protests have been raging for the past two days, demonstrators are chanting, “Don’t be afraid, we’re all together.” A large contingent of anti-riot police have surrounded the area. The demonstrators have also set vehicle tires ablaze to prevent the regime’s repressive forces from attacking and dispersing them with tear gas. 7:00 PM CET: Ahvaz is the latest city to join the widespread protests that began this morning in different parts of Iran. People have gathered in the city’s Naderi as the sun sets. Security forces are threatening people and ordering them to disperse.In Tehran’s Valiasr Street, clashed between protesters and security forces continue as night settles. Demonstrators have set trash bins ablaze and blocked the road to hamper the movement of security forces. People have lined up in front of anti-riot police and are preventing them from dispersing the crowd. In Karaj, protesters are chanting “Death to dictator” and calling for unity among the people. “Don’t be afraid, we’re all together,” they say. “The cry for freedom is becoming louder, and the uprising is expanding more and more every moment. There is no force more powerful than the united force of young people,” Mrs. Maryam Rajavi said in a statement in support of protesters. 6:00 PM CET: In Tehran, protesters are chanting “Death to Khamenei,” calling for the overthrow of the supreme leader, the highest authority in the Iranian regime and the symbol of the Iranian regime’s power. Protesters, mostly youth, are clashing with security forces. Videos obtained from Valiasr Street, where protests are taking place, show protesters routing security forces sent to quell the demonstrations. Demonstrations and clashes between protesters continue in Isfahan, Shiraz, Karaj, Mashhad and Arak, other cities where protests have been ongoing during the day. Elsewhere, in Shiraz, protesters are chanting slogans against the regime and its repressive forces. In one video obtained from the scene, protesters are saying that the mullahs must go and others are calling for Rouhani to let go of the state. 5:00 PM CET: Protests reach the capital. According to local reports, people have gathered at the Valiasr Street, Tehran’s longest avenue and are chanting, “Proud Iranians, support, support.” Videos posted on social media show the protesters are confronting security forces that have been dispatched to disperse protesters. Security forces have injured a young female protester, according to reports. Since Tuesday, protests have been ongoing in several cities over economic problems and the Iranian regime’s corruption and mismanagement. Protests have quickly turned into anti-government demonstrations. Tehran has now joined seven other cities, where people have been protesting against the government and, in some cases, clashing with security forces. In Mashhad, there’s heavy security presence but protesters are standing their ground and chanting, “the people won’t give in to disgrace. 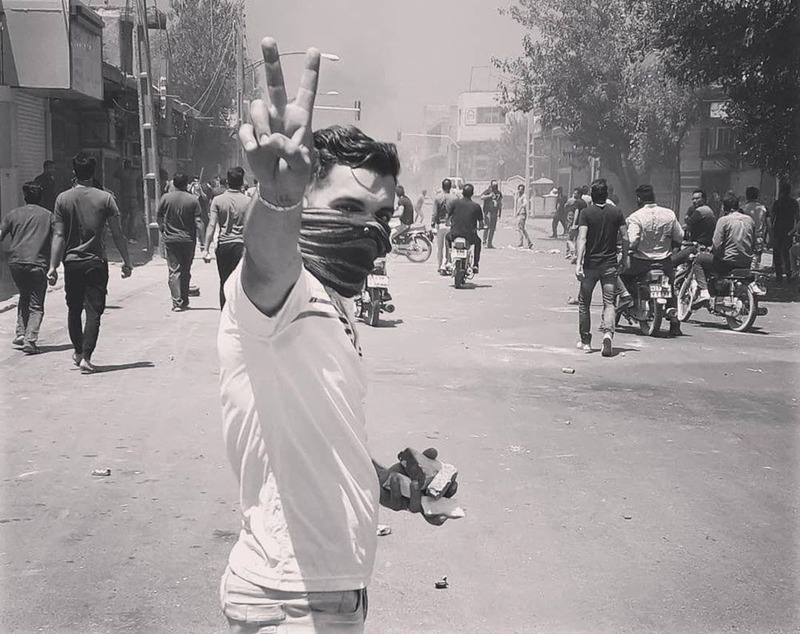 In Isfahan, where some of the heaviest clashes have been reported, the protesters are showing no fear of security forces and resisting in organized groups, using rocks, bricks, wooden sticks and bare hands to resist. 4:00 PM CET: Protests that started this morning over economic grievances and the Iranian regime’s suppression continue in seven cities. In Shiraz, protesters are chanting “Death to dictator” and “Death to Khamenei,” the supreme leader of the regime and the person who has final say on all matters of state. In Isfahan and Shiraz, the Iranian regime’s repressive forces are trying to disperse protesters with tear gas, but the protesters continue to hold their lines and are lighting fires in various parts of the city. In Isfahan, heavy clashes between protesters and security forces have been reported. In Najaf Abad, the women are actively participating in the protests. 2:00 PM CET: Protests in Isfahan have turned into heavy clashes between demonstrators and state security forces. Videos obtained from Shapour, Isfahan, show that people are throwing rocks at anti-riot police. The air is thick with smoke of burnt tires. In Gohardasht, Karaj, security forces are blocking the roads with concrete blocks to prevent demonstrators from gathering. 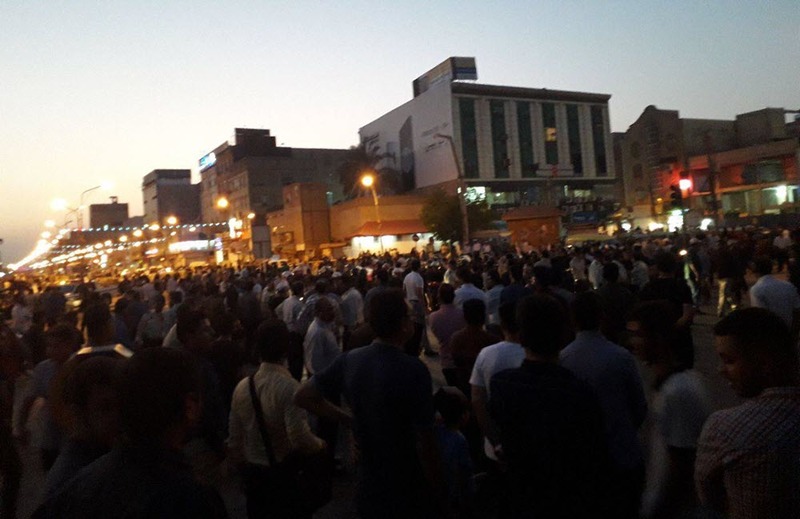 Protests also continue in Shiraz and Arak, where the people are chanting slogans against the regime and calling for solidarity among the people. In recent weeks, different cities of Iran have seen protests by citizens who are fed up with the regime’s corruption, the plunging currency value, unemployment and high prices. But economic woes have triggered the protests, most demonstrations have quickly turned into anti-regime protests with slogans calling for the overthrow of the regime in its entirety. 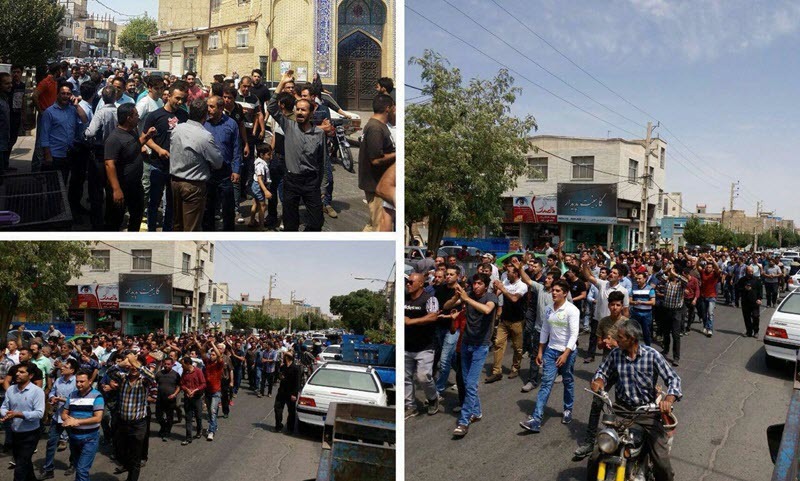 12:00 PM CET: The people of Arak city in Markazi province have joined the widespread protests in several cities of Iran over economic grievances. Like other cities, the Iranian regime has dispatched contingents of security forces to disperse protesters. But demonstrators are confronting the regime’s repressive forces and repelling them, video obtained from the protests show. Arak is the seventh city where demonstrations have been ongoing on Thursday. Other cities include Isfahan (Shapour district), Najaf Abad, Shahin Shahr, Karaj, Mashhad and Shiraz. State-run media has tried to downplay the situation. Earlier today, the Islamic Republic News Agency (IRNA) reported that the police has prevented protests from rallying in Isfahan. Meanwhile, local reports and videos posted on social media show protesters clashing with security forces. In Shiraz, protesters are chanting “Repression has no effect” and calling off the regime for spending the country’s wealth on its foreign interventions. “Not Gaza, not Lebanon, my life for Iran,” the protesters are chanting, a criticism of the regime’s costly meddling in the countries of the Middle East region. 11:30 AM CET: Sixth city joins nationwide protests. According to reports obtained from inside Iran and social media, the people of Najaf Abad, Isfahan, have also come to the streets to protest against the deteriorating economic situation. Najaf Abad is the third city of Isfahan province where protests have erupted on Thursday. In Shahin Shahr and Shapour, the other cities of Isfahan where protests are ongoing, demonstrators have been resisting against security forces that have been dispatched to quell the protests. Mrs. Maryam Rajavi, the president-elect of the National Council of Resistance of Iran, hailed the protesters of Isfahan for their fearless revolt and heralded the end of the mullahs’ tyranny. 11:00 AM CET: Tensions are growing in cities where protests have been raging since this morning. According to local reports, in Mashhad, security forces opened fire on protesters and have arrested several people. The people are chanting slogans against regime officials and calling on them to resign because of their inefficiency. In Shiraz, the protesters are resisting against security forces and repelling them. The protesters are calling on their fellow citizens to join the protests and are calling for more demonstrations this afternoon. In Shahin Shahr, Isfahan, protesters are denouncing the regime’s officials for their involvement in financial corruption. The protesters are chanting, “One less case of embezzlement and our problems are solved,” a reference to the corruption of government-backed financial institutions. In Shapur, Isfahan, protesters continue to set fire in the streets to block the path of security forces and prevent them from using tear gas against demonstrators. 10:30 AM CET: More cities have joined the protests that began this morning. According to reports and video obtained from inside Iran, people from two areas in Karaj, west of Tehran, have started pockets of demonstrations. 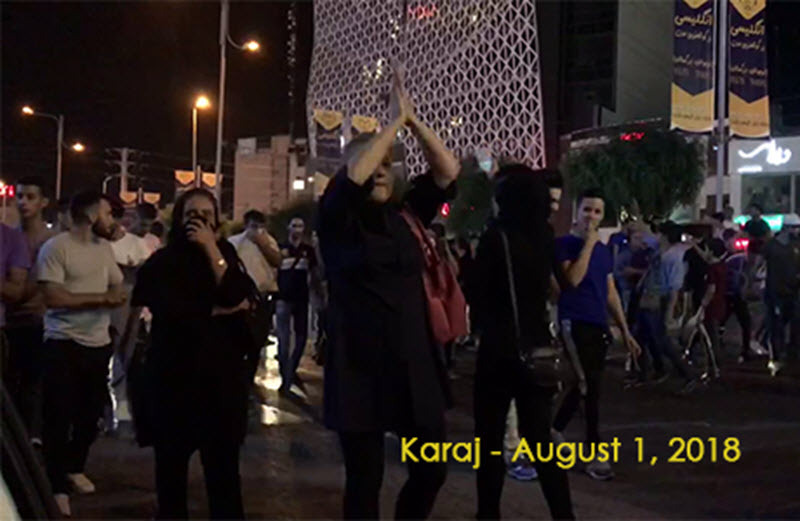 In the past two days, demonstrations have been ongoing in Karaj and protesters have resisted the Iranian regime’s efforts to disperse and quell the demonstrations. Protests are now ongoing in five cities and four provinces. 10:15 AM CET: Protests which began earlier today in Shiraz and Shapour, Isfahan, have now been expanded to other cities. According to the local report, in Shahin Shahr, Isfahan, the people are gathering into groups and forming demonstrations over economic woes. The protesters are calling for their fellow citizens to join the protests against the regime.